Oh sure, your iPhone or Galaxy is about a million times faster, and stores a several gazillion times more stuff, and has color displays and cameras and wireless connectivity and more apps installed than you can even remember , but you gotta start somewhere. 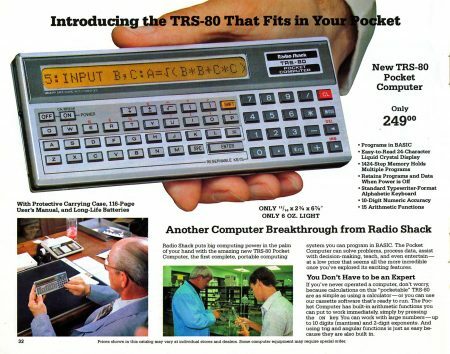 And basically it started with this device in this catalog in 1980. The TRS-80 Pocket Computer specs are so puny it beggars belief (except perhaps for the 200-hour battery life). Heck, it even required a kind of docking station just to swap programs (on cassette tapes). But to some technophiles in 1980, it promised an exciting future – an actual self-contained programmable computer in you hand. 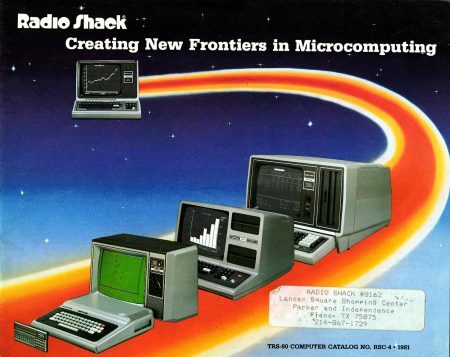 It’s hard to believe that for upwards of 10 years, Radio Shack was a name to be taken seriously in the computer business. There were dedicated Computer Centers, and the TRS80 catalogs listed all the latest Tandy hardware and software you could buy or order at your local “Shack.” Ironically, one can point to the rise of the smartphone and its apps as a key factor in the chain’s decline, final, and eventual bankruptcy. Previous Previous post: Mars Needs Women?